CHECHESMITHNATION : Rich Kid EJ Johnson Stylishly Spotted Out And About! 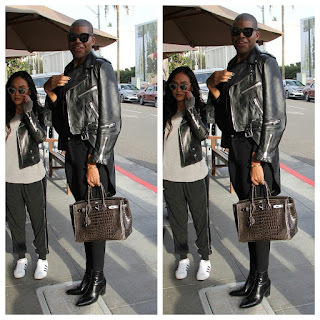 Rich Kid EJ Johnson Stylishly Spotted Out And About! Magic Johnson's son EJ , was spotted rocking his Hermes.Birkin Crocodile bag, while dressed in a black leather jacket worn over a black leggings and a pointy booties. Hermes Birkin Croc Bag worth $100,000. Yesterday, the fashionista rocked out in white ripped at the knee skinny jeans worn with a white tan, a trendy fur cape and a.cute Chanel backpack to spice up her look. She does look great in her white and fur cape outfit.... But am kinda confused, is she a she or he? She looks like both to me.